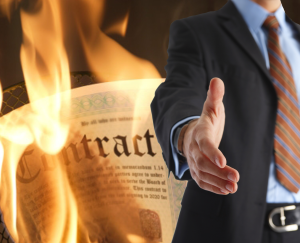 When things go wrong in the world of business and disputes surface, it’s more than likely that the cause of contention was a breach of contract. Agreements are essential in the commercial community. In order to form a trustworthy business relationship, you have to know that commitments will be honored – whether they were made in a signed document, or simply a witnessed handshake behind closed doors. Unfortunately, these types of issues are common. Not everyone is honest, so it’s important that you know how to swiftly pursue the most efficient course of action in the event of a breach of contract. Ideally you should strive to stop breaches of contracts before they even happen. An important part of the process of drafting a contract is to seek help from an experienced business lawyer who knows what aspects should be enforced, if not enforceable, and provide advice detailing how to make it so. It’s unlikely that the first draft of a contract will be the most effective – as with all writing, revision is crucial. If certain terms are voidable, meaning they might be useless in certain situations, then care should be taken towards modifying the terms so that the contract is equally strong in any predictable circumstance. Proper word choice is important. If it could be argued that a stipulation is “unfair,” then that term might be deemed void by court officials. There might be a situation in which a breach of contract is expected. It’s always a good idea to check for signs of potential dishonesty during the drafting process. If a party seems shifty about certain terms, or speaks as though they are trying to leave themselves loopholes, then it’s possible you should including adequate assurances in the conditions of the agreement. If done effectively, this will force potentially dishonorable parties to provide evidence proving that they intend to abide by the terms of the contract. Oftentimes, business lawyers are hired to draft and evaluate contracts themselves. It makes sense – who better to select the strongest, most enforceable legal diction than a person who is highly trained in the field? Word choice is everything, so it doesn’t pay to take chances. Specific Performance: When damages in the form of monetary reimbursement is not sufficient, courts might order that the offending party still must fulfill the terms of the contract that was violated. Damages: This refers to financial compensation paid from those who breached the contract to those who were negatively affected by the breach. At Turner Law Offices, P.C., our team of attorneys has years of experience working with clients in a variety of circumstances involving business contracts. Whether you’re a small business or a corporation, we know how to best approach the drafting and modification procedures, as well as the most efficient means of confronting potential or inevitable breaches of contract. A skilled lawyer is ready and waiting to do whatever it takes to assure your business contracts are enforceable, so call today or go online to set up your Free Initial Consultation.